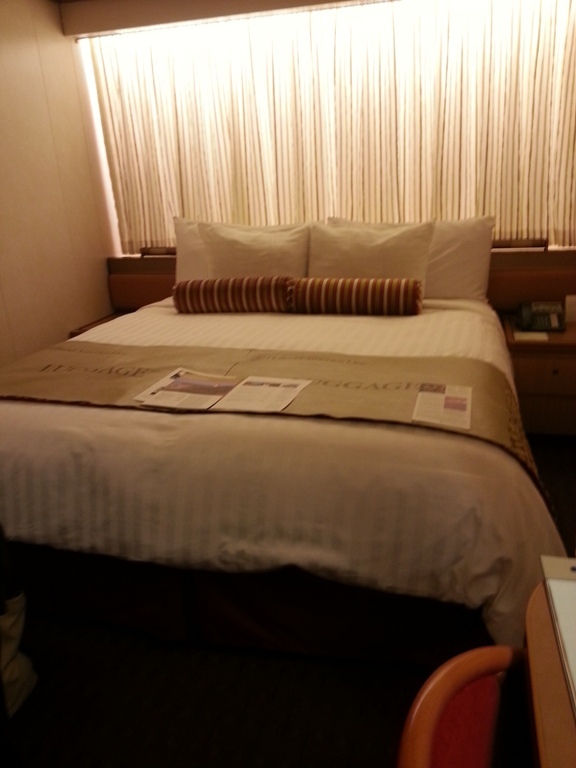 Our marvelous adventure with Holland America Lines – cruising to cooler temps! Having only been on a cruise once, and not being very impressed, we decided to give it a second chance with the opportunity to get out of the Florida heat and head up to New England and Nova Scotia. 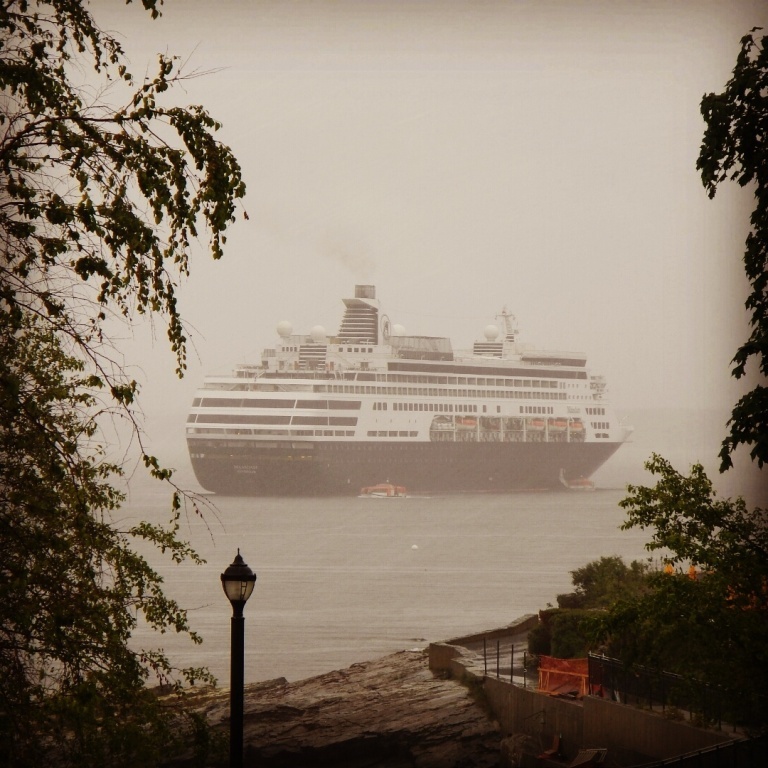 Holland America Lines was recommended by friends and, upon research, we found this cruise line to be highly rated. Waiting until the last minute gave us the opportunity to take advantage of much lower rates so we decided to go for it. 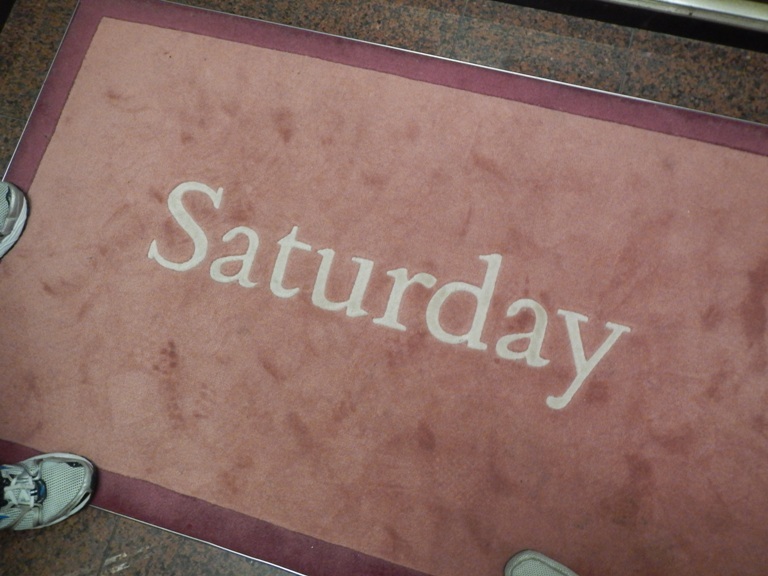 Needing to be reminded what day it is…proof of a great vacation! Mears Taxi picked us up at 6 am for an early flight to Worcester where my childhood friend picked us up. We only spent about 20 minutes with her as she just drove us to the Worcester Bus Station for our rendezvous with a Greyhound bus to Boston. From there we walked about a mile and a half to the cruise terminal, not minding the trek as we had minimal luggage to roll behind us and the weather was breezy and cool…such a relief from 100 degrees in Orlando. Checking onto the ship was quick and seamless. As a precaution, and having read this many times in cruise blogs, we checked in our suitcases but carried a tote with our toiletries, drugs and clean underwear, just in case our baggage was delayed or delivered to the wrong room (not to worry, though, all 3 bags were sitting outside our door within a couple of hours). So the cabin was very roomy with two twins put together to form a king sized bed, along with a sofa which folded out if there were a 3rd party in the room. Three separate closets provided more than adequate storage and the bathroom, though tiny, was equipped with a roomy shower and all the other essentials needed. 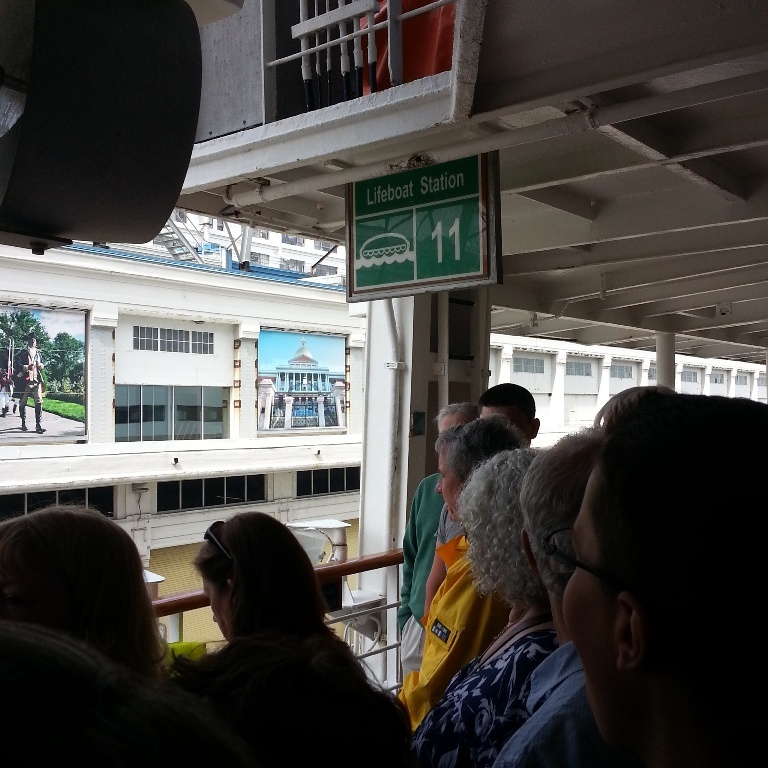 This was our second cruise using an interior cabin and I think I would enjoy the experience a bit more if we opted for a window or lanai. Of course, the cost rises with each amenity. 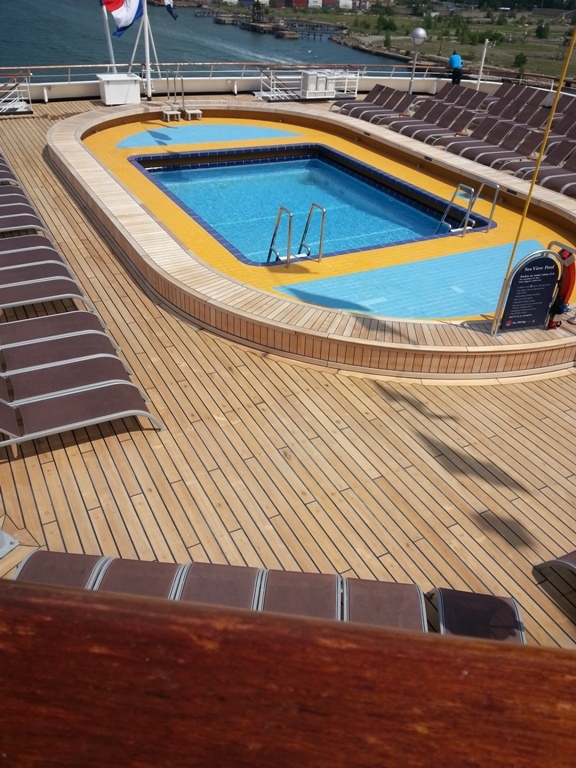 After checking out our digs for the week, we wandered up to the Lido deck for a bite to eat. The buffet was well-stocked with every food imaginable, along with a poolside diner for dogs and burgers. The cost of the cruise includes food from said buffet and the Rotterdam Restaurant, a 2 level, waited dining room with different menu choices each day. It’s a beautiful space and the food and service were impeccable, not to mention the views. Two nights are designated “formal” and require the proper attire, dressy for women, coat and tie for men. We opted out of this as we only brought carry-on luggage and didn’t want to waste the room with additional “fancy” clothing. (We’re such shlubs!) On those nights we chose to dine from the buffet. When we made our initial reservation, we picked “Open Dining” and just took our chances walking in whenever we wanted, never having a problem with getting seated. Some might choose specific times to dine, however. We could have participated in a slew of activities once we arrived but decided to chill out and enjoy watching Boston recede into the sunset as our ship cruised out of the bay. We also missed the show that night as it didn’t start until 9:30 and having been up since 5 am we crashed. Looking forward to the next day’s destination, Bar Harbor. 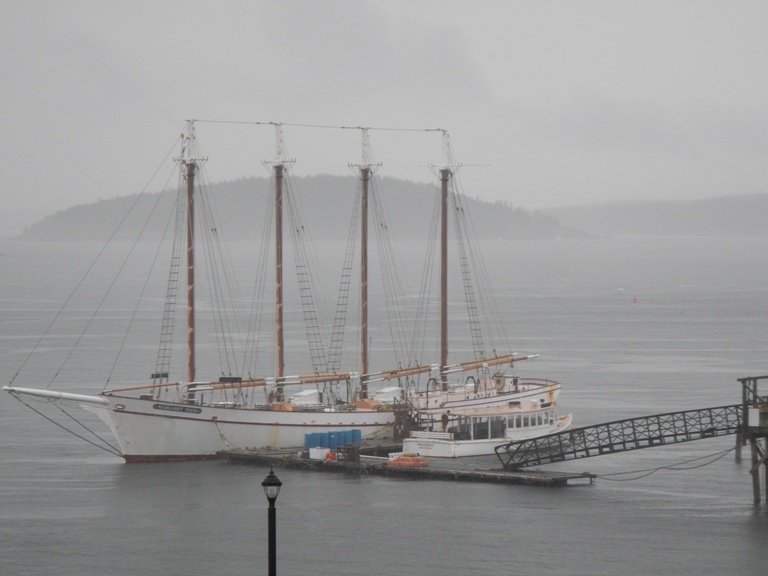 Woke up to a miserable, rainy day in Bar Harbor with temps in the upper 50’s. On this trip we did not sign up for any HAL excursions but did find a private tour of Acadia National Park, through Acadia National Park Tours, which we reserved online. Unfortunately, the rain and fog messed with our plans so we called and canceled. We were told the bus runs rain or shine but the fog would seriously impede our view of Cadillac Mountain. We had a leisurely breakfast in the Rotterdam and hung out on the ship, exploring the many decks, including the Casino, library, art gallery and the two restaurants which are not included in the fare, The Pinnacle Grill and Cavaletto. Noticing that, even with the nasty weather, people were still taking the tenders to town, we decided to man-up and face the weather. Of course, we did not travel with umbrellas or raincoats so we got wet just getting off the tender but quickly found a shop selling $3 plastic ponchos and walked around looking like the tourists that we were. 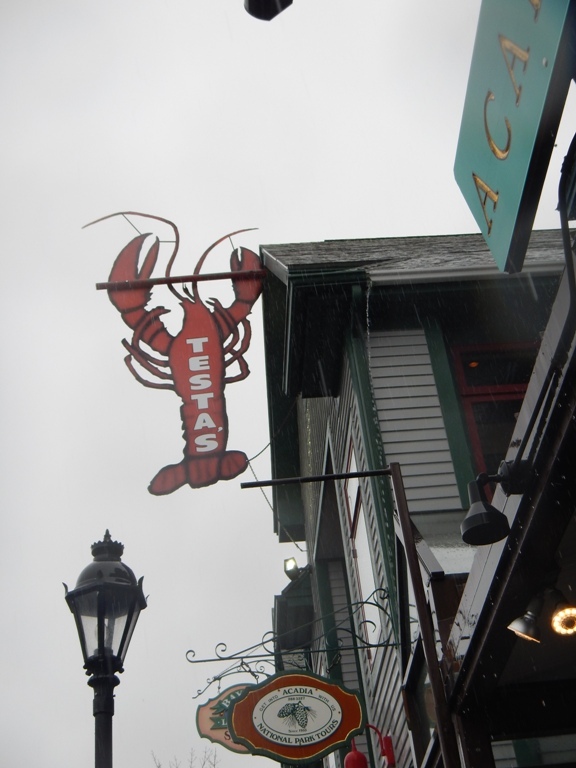 The shops and restaurants of Bar Harbor are quaint and it felt good to stretch our legs, albeit dodging puddles. To be honest, we relished the cold rain after spending a week in 100 degree temps back home. Back on the ship to dry off and chill out in the Explorations Café Library where you can grab a latte and sit at a window overlooking the town, and the rain, and brush up on the next day’s destination, Halifax. Each day we were given a full schedule of activities. You will only be bored if you choose to be bored. There is so much going on all day…workout activities, card games, Digital Workshop, Chef’s Corner culinary sessions, art auctions, wine tastings, spa seminars, jewelry sales, religious services, even regularly scheduled AA meetings…the list goes on and on. 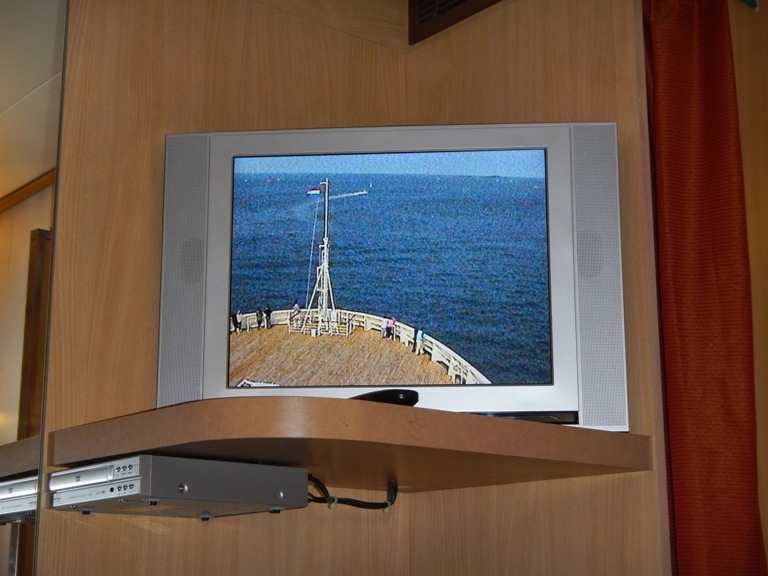 Every night there is a performance in the Showroom at Sea, a two level theater with comfortable seating and great views. 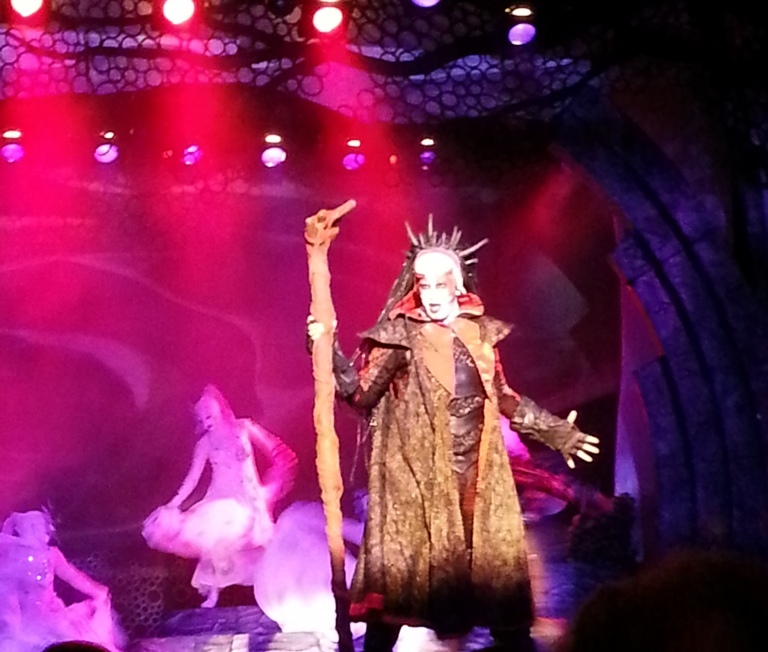 The spectacle “Droom” is being shown currently on the Maasdam, a musical fantasy with phenomenal costumes and familiar music, set to “an enchanted garden where mystical creatures both good and evil dwell.” We were thoroughly entertained. 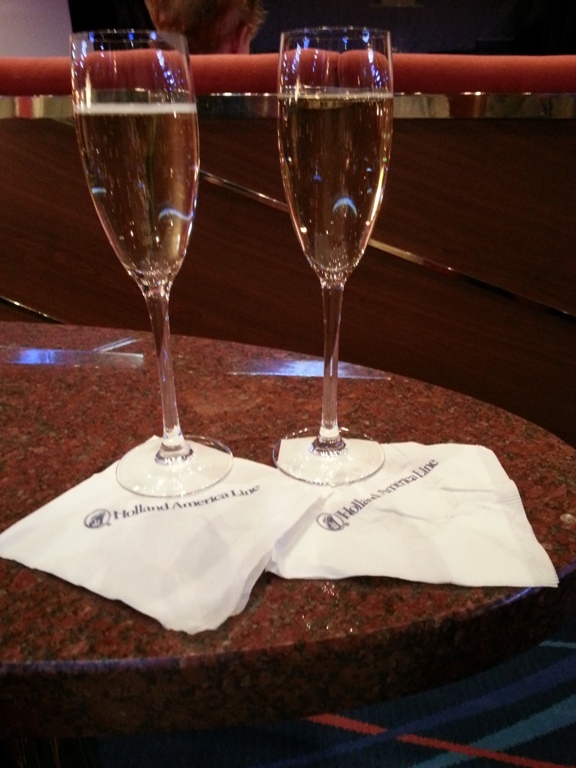 Prior to that champagne was served as a toast to the ship’s captain and crew. Then back to our cabin where yet another terrycloth animal awaits, along with chocolates and a turned-down bed. 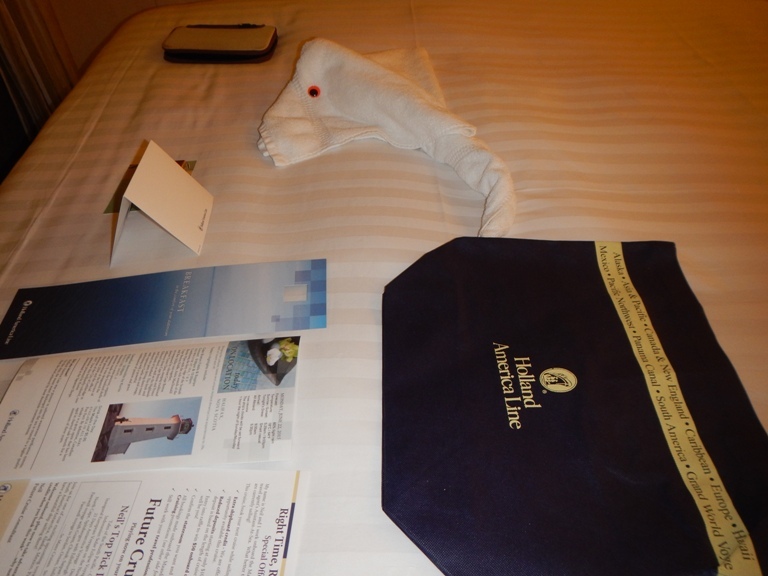 Getting very used to being treated like VIPs….more later. 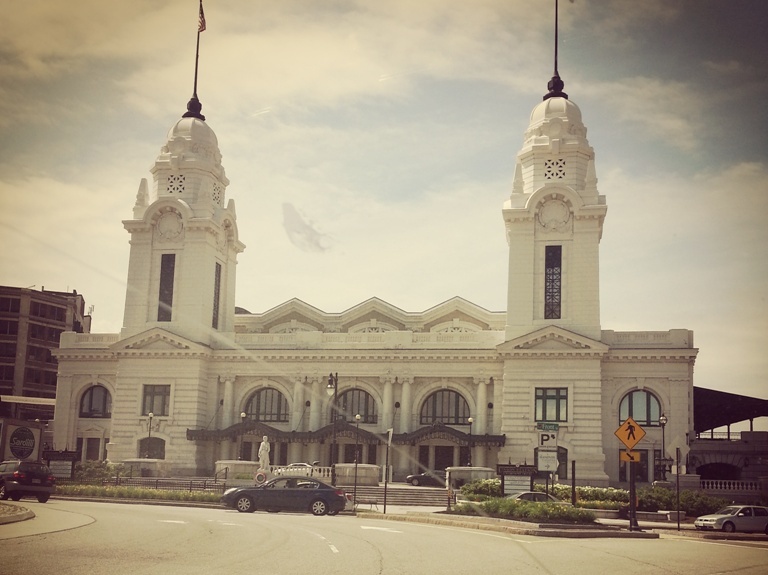 This entry was posted in Travel and tagged American Airlines, Amtrak, baby boomers, Bar Harbor, Boston, Canada, cruise, Greyhound, Holland America Lines, JetBlue, Maasdam, Mears, New England, USAir, Worcester. Bookmark the permalink. Susan, your photos are excellent right along with the commentary. I was actually feeling ‘chilled’ seeing the foggy rain photo and reading your script. Great job! Thanks, Terry, more to come ad nauseum!